Irregular Verb Memory Game 3 (as well as game 1 and game 2) let you have fun and give your memory a workout while reviewing the most common past tense irregular verbs in English. This third game reviews the past tense of buy and think --the most common 'ought' past tenses. The pasts of fight and seek are made the same way, with the first letter and o-u-g-h-t; catch and teach are the same except that the 'ou' is replaced by'au'-- with the same sound. Instructions: Your goal is to turn over 2 cards that belong together: the present tense of a verb with its past tense equivalent.There are twelve cards in 3 rows. Players (if you are playing with someone) take turns choosing two cards to turn over. If the cards match, they will stay face up, and the player who chose them wins that pair. If you are playing alone, you win if you can beat your previous time. It's trickier than it sounds! For a simple way to learn more irregular verbs by the patterns of their endings, see 12 Lists of Irregular Verbs. To practice those and other important irregulars with a gap-fill exercise, see List of Irregular Verbs: the Top 50. You might also want to review the Simple Past Tense, which shows how to form the regular past tense, along with providing a few spelling and pronunciation tips. Printable ESL Classroom Games has two game packets with printable irregular verb matching cards to cut out for playing the memory game in a classroom. Those games include 16 cards (a four x four grid) each, so they can include more verbs in each game. 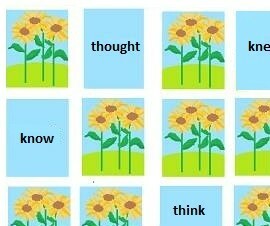 Try some other interactive concentration games: Irregular Verb Memory Game 2 (to eat, make, see,take, say, and tell), Roots Memory Game 1 to practice words like inquire, require, request, and quest, Roots Memory Game 2 with cedere or Game 3 with vertere, Custom Memory Game 1 or Game 2 to practice phrasal verb idioms, or a simple kids' matching game just for fun. Home>ESL Games>Irregular Verb Memory Game 3.